It really doesn`t matter if you`ve got an acre of land or a window box – when it comes to giving nature a home, where there`s a will there`s a way. Wild creatures like cosy too! So don`t discount yourselves if your outside space is a balcony or a tiny garden, you can help all kinds of wild creatures. Tubs and planters are a great way to add a splash of colour whilst also providing a great home for wildlife. They can be used to grow climbers and small shrubs, or even to replicate a lawn or wild flower meadow. Climbers take up little space against a wall or trained up and over a balcony. When grown over a railing, they act as a windshield and reduce the drying effect on the other plants in the tubs, as well as providing shelter. The beautiful flowers also provide colour, scent and a source of nectar. Herbs work well in pots in the sun; lavender, rosemary, mint, oregano, thyme are all good for bees and practical as well. Flowering plants are great too; coneflowers, sneezeweeds and rudbeckias can work well in containers. Dwarf fruit trees like apple, plum and pear provide wild food sources for birds, and climbers like honeysuckle, ivy and clematis have good wildlife credentials as they provide various benefits from cover, berries and nectar. Water features don`t have to be huge, elaborate statues – tubs are a great place to house a water feature too. You could use an old sink or washing up bowl and turn it into a haven for wildlife. Place the container out of direct sunlight and prevailing wind. A sloping edge will give birds somewhere safe to drink and bathe. A slightly less attractive, but equally as beneficial home for nature, is a pile of dead wood. Yes really! It`s often overlooked but birds will feed on the insects that make their home in old wood and it may even provide a nest site for a bird or a roost for a bat. Creating a wood pile is easy in a smaller garden – an old bucket with a mix of wood chippings and soil or small logs placed among planters or used to make a raised planter will do the job nicely. Its best to put your wood pile in the shade – too much sunlight will dry it out but a damper spot will attract all sorts of creepy crawlies. Feeding birds is easy and rewarding whatever kind of garden you have. A hanging feeder can be attached to a hook on the wall or a window feeder is a great option. 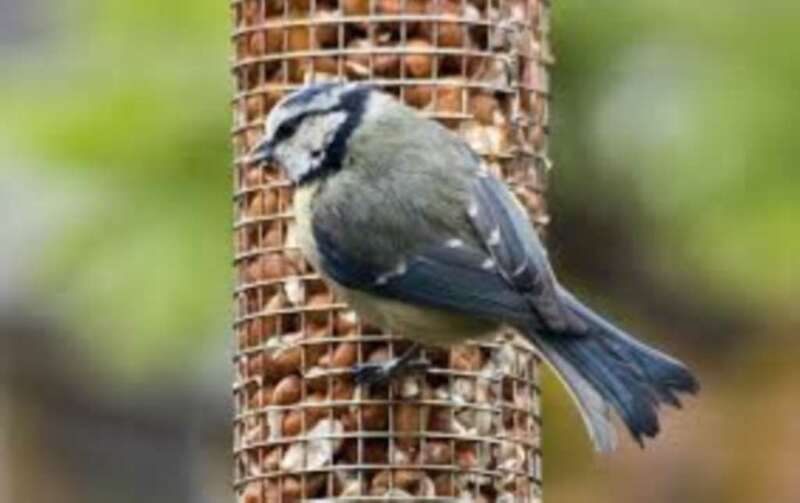 With any luck once your local birds know your feeder is there and regularly replenished with treats like millet, nyjer seed and sunflower hearts, you may even have a friendly face dining on your feeder while you do the washing up! Like us, wild creatures have three basic needs – food, water and shelter. By planting a range of shrubs and flowers you will go some way to providing shelter but you could go one step further and put up a nest box. Again, avoid direct sunlight and strong winds, and easy access for predators like cats. Birds use nestboxes for breeding in Spring and throughout the summer but they also use them as a shelter from the weather in winter. Wild creatures won`t turn their nose up at any guest accommodation if it offers them a place to rest and refuel so enjoy turning your cosy outside space into a great home for nature!